I’ll have to add some photographs later, but I wanted to record this experiment for future use. Quarter the limes and squeeze the juice into whatever container you plan to use for brining. Add in the garlic, jalapeno, cilantro, salt, sugar, vinegar (guessing 1/4 cup) and olive oil (guessing 2 tbsp worth). Mix everything together and then add the pork chops, thoroughly coating them in the mixture. Add in the squeezed lime quarters and put in the fridge for several hours. Remove the pork chops from the brine and scrape off as much garlic, cilantro leaves, etc as you can from the meat (scrape back into the container). Heat a cast iron frying pan until it just starts to smoke, and sear the pork chops for 2 minutes on each side. Pour the brine over and around the chops and put the pan in the oven. The cooking time will depend on the thickness of the chops (and timing of when you removed from the fridge). For an inch-thick chop, expect it to take 9-12 minutes in the oven. I’m always a fan of the combination of taste and simplicity, especially these days when my schedule does not allow for extended adventures in the kitchen. This dish was a snap to make, and tons of flavor. The oregano and prosciutto combine beautifully and seep into the roast. Pre-heat the oven at 350F. Sprinkle the loin liberally with freshly ground pepper and fresh or dried oregano. Because the prosciutto has so much salt, I would argue not adding any salt at this point. 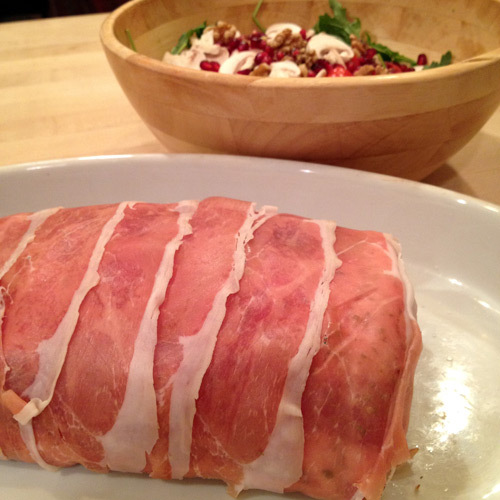 Wrap the loin in prosciutto, overlapping each layer. Do not use cheap domestic (US) prosciutto — it has weak flavor and your results will be boring. Roast the loin in the oven — it can take 30 minutes to an hour depending on the size of the loin. Remove the loin when an instant-read thermometer shows 135 degrees. Loosely cover in foil and let rest for 5 minutes, then slice and serve. Taste and only add salt at this point if you think it is needed. 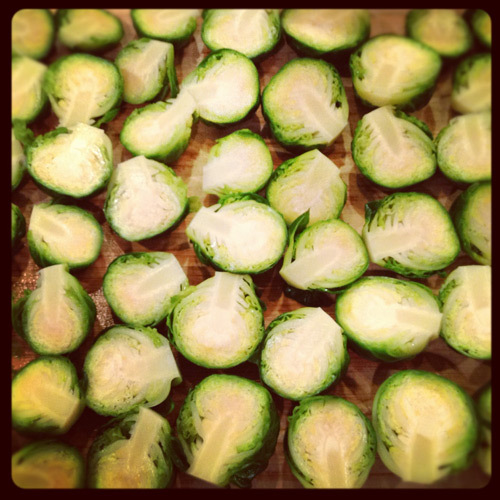 We served this with a nice green salad, roasted brussel sprouts, and a hearty Italian wine. I love to grill pork tenderloin, but with a freezing spring here, I have been baking in the oven instead for a tasty but extremely low-maintenance mid-week dinner. Here are two simple approaches, one European-inspired, the other Asian-inspired. If you can marinate the meat for 30-60 min before putting in the oven, so much the better. 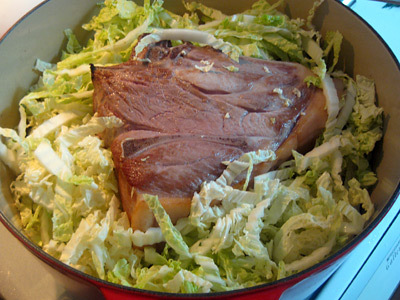 Place the pork in an oval baking dish. Smear the mustard all over the pork, and then drizzle a teaspoon or so of olive oil and about a third of a cup of white wine vinegar. Liberally salt and pepper, and then sprinkle a couple pinches of each of the dried herbs (crush up the fennel seed a bit first). Pre-heat the oven to 425F and make sure the meat is well-coated in the sauce before putting into the oven. After the pork cooks for 10 minutes, turn the oven down to 350F. Flip the tenderloins after 25-30 minutes. The critical factor is pulling the meat out at the right time. Start checking the temperature about 45 to 50 minutes in. Insert an instant read thermometer and remove each tenderloin when it reads 135. Let rest under foil for five minutes, then slice and serve, spooning some of the delicious sauce on top. Cook in the same way as above. I rarely mix fruit and meat. A pork-and-apples dish was the cause of a veritable showdown at the OK Corral of my mother’s kitchen when I was 7 years old. But a few years ago when I was just starting out with this blog, I remember doing a pork roast with orange juice and loving it. I never recorded the recipe, but my brain did store away a mental bookmark to Bitchin’ Camero’s recipe from back in May 2009. Last weekend, I finally took another shot at my own version. The result was stunning. I recommend marinating the meat for half a day or more beforehand. To make the marinade: zest the lime, finely chop the garlic, and mix it all together with the cumin, salt (for table salt, maybe 1/2 tsp), and a couple pinches of black pepper. Rub this all around the meat, surround with the onions, pour the orange juice on top, and squeeze the juice from the lime over it all. Cover with plastic wrap, and if you can, turn the meat once or twice as it marinates. To cook, pre-heat the over to 350F. You can see above that I transferred it all to a larger baking dish. Cook the pork for about an hour, flipping it halfway, and remove from the oven when an instant-read thermometer registers 140F to 145F. Cover with foil and let it rest for 5 minutes before slicing. 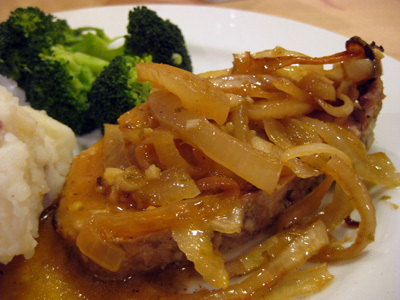 Serve with the onions, which become deliciously candied, and drizzle the sauce from the roasting dish on top (if you left a good portion of fat on your roast, you might skim the sauce first). Repeat: do not forget to plate the onions! Heaven. This dish isn’t going to turn me into a fruit-and-meat man, but I will definitely be making it again. I love Autumn. I love the temperature, the colors, the clothes, and of course the fact that my favorite cooking style fits the weather more naturally. This recipe falls squarely into that bucket, and was a huge hit with Lisl and a friend who came over this evening. 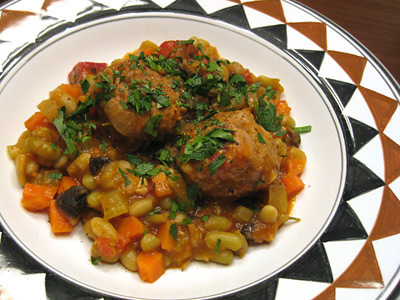 It combines a homemade Italian meatball with a French-style peasant stew. Cook the flageolet beans until al dente: place in a large pot with 1″ of water above the top of the beans. Add 3 bay leaves, bring to a boil, then remove the lid and simmer. Soaking beforehand will speed up cooking time. While the beans cook, do the next few steps. Pound up the fennel seed, peppercorns and pepper flakes with a mortar/pestle, then add to the ground meat along with the salt. Mix together then mold into meatballs about 1.5″ in diameter. Heat up your stew pot (I use a dutch oven) on med-high heat with a little olive oil and brown the meatballs. Then set them aside and turn off the heat. Spoon out most of the oil left in the stew pot, leaving enough to coat the bottom. Turn the heat back on to med-low. Cook the onions until translucent, then add the garlic, celery and carrots. Cook for a few minutes, then add the diced tomato and mushroom. Separate the parsley stems and leaves, setting the leaves aside. Create a bouquet garnis by tying the parsley stems, rosemary sprigs, and 1 bay leaf together with kitchen twine. Add the bouquet garnis to the pot, and continue to let the vegetables gently cook. Once the beans are al dente, drain or optionally reserve the cooking liquid. Add the beans and meatballs to the stew pot, add the wine, and add either water or the bean cooking liquid until the liquid level is about three-quarters up to the top of the food. Make sure the bouquet garnis is immersed, cover and either place the pot in a 350F oven or let simmer on the stove top. After 40 minutes, taste for salt and gently stir in the tomato paste. Remove about 1/2 of beans and vegetables to a food processor and puree. Return to the pot and continue to cook until the beans are soft and the flavors have melded. This step improves the texture, thickening the stew (I hate the common use of flour or starch to thicken). Chop up the parsley leaves waiting in the wings all this time. Serve with the parsley and a little fresh pepper scattered on top. It is so nice to have grilling season back upon us. In many cases, our jobs as cooks is to get out of the way and let the food and fresh product do the talking. Here are notes from Saturday’s dinner, when we had a few guests over for Lisl’s birthday. I make this salad slightly different every time, but my basic routine is the following. Carefully wash the canned beans in a colander, drain and add to the bowl. Cook each ear of corn, still in the husk, in the microwave for 2 and a half minutes, then remove husk and take kernels off with a knife once cool enough to touch. Dice the spring onions, using all of the green part, and toss it in with the diced red onion, tomatoes, jalapeno and sweet peppers ( I like using a mix of red, green, orange and yellow). Dress the salad by taste. Stir in the cilantro, juice from 1 lemon, juice from 3 or 4 limes, a sprinkle of olive oil and champagne vinegar (but go light on the oil and vinegar — you want the citrus to stand out). Add salt to taste, and add some freshly ground pepper. Depending on how juicy your limes are, the number of limes you want to use will vary. I like dressing this ahead of time so everything absorbs some of the citrus flavor. 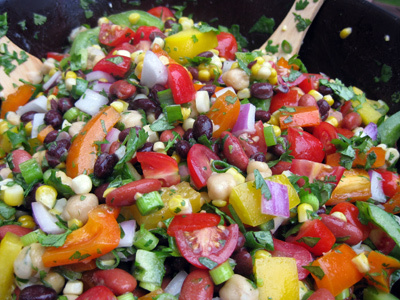 This is a great, hearty and bright salad for serving a large number of people. 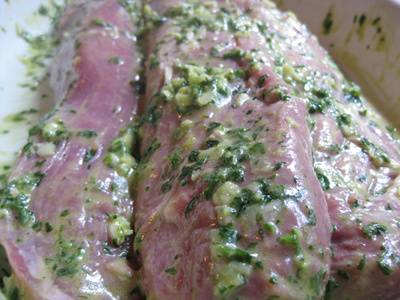 I made this marinade for use on three pork tenderloins — the amounts are ballpark but you can’t really go wrong here. With a mortar and pestle, mash up the garlic and herbs. Stir in the rest of the ingredients then rub all over the pork. 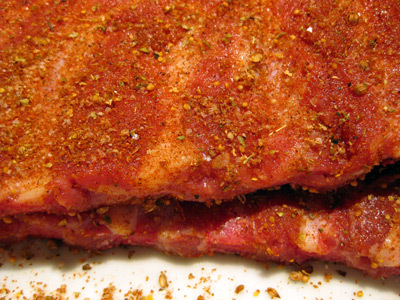 Cover and place in the fridge for several hours, then grill by searing the pork and then cooking on a cooler part of your grill until the meat hits the right point of firmness. Side note: I was cooking on my brother-in-law’s grill the other weekend and I was reminded how difficult it is to work with unfamiliar equipment. I totally overcooked the chicken. On my own grill, where I know how and where heat distributes, I was really pleased with getting these tenderloins perfect. Lisl laughed and said it shows just how tough those Top Chef challenges are when they get thrown into crazy circumstances. Mince up a big shallot (or more than one shallot) and let the shallots sit for 20 to 30 minutes in the juice from 1 lemon and a couple splashes of champagne wine vinegar. Then wisk in some olive oil, a dab of dijon mustard, and a pinch of salt and pepper. Toss over a bunch of baby arugula (rocket), with some nice tomatoes and maybe some sliced mushrooms or red pepper. Can’t beat it. I’ve had Disqus installed on my tech blog forever and I *finally* have it installed here. I much prefer the threaded comment system and after a few goes, it looks like it has imported all the old comments. To marinate the pork, start by slicing some garlic cloves into little pointy-ended stakes. With a paring knife, poke a hole in the pork and the stuff the garlic piece inside. 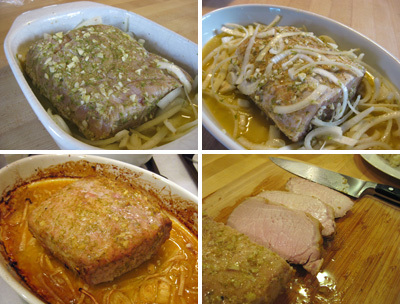 Do this all over your pork loin, spacing them out by an inch or two depending on your love of garlic. Then rub about a tablespoon of kosher salt (less if using fine table salt), the mustard and the rosemary all over the pork. Place in something you can put in the fridge, then drizzle olive oil and a couple tablespoons of apple cider vinegar over the top. Cover and place in the fridge for one or two days. To roast, remove the pork from the fridge, place in a baking dish, and let it come to room temperature for about 20 minutes while you pre-heat the oven to 450F. 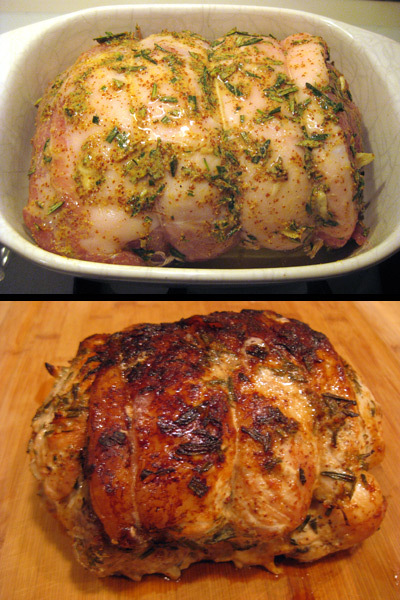 Roast the pork for 15 minutes, then pour 1/2 cup of wine or vermouth over the top. Turn the heat down to 325F. It should take the pork about 2 hours to cook, although start checking with an instant read thermometer earlier. Every half hour or so, spoon the liquid from the baking dish over the pork. If the dish is dry, add a little more wine or water. Remove the pork and let it rest (place a piece of foil on top to keep it from getting to cold while you finish any remaining parts of the meal) when the instant read thermometer gets to 145F or 150F. To make the gravy: add some water and wine/vermouth to the baking dish, a small amount of flour (maybe a quarter to half a tsp) and a pinch of salt and deglaze the dish on the stove top (note: if you are using ceramic, then get a heat diffuser rather than having the dish right on the flame). Remove the excess oil — one simple method is to pour it into a measuring cup and then pour off the oil that rises to the top. 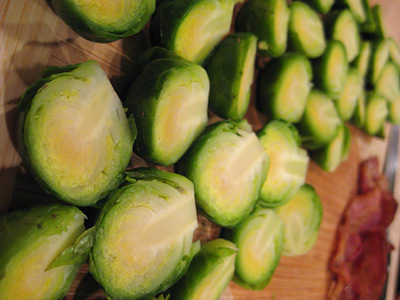 We served this with some brussel sprouts, parboiled and then sauted with champagne wine vinegar, and roasted potatoes. 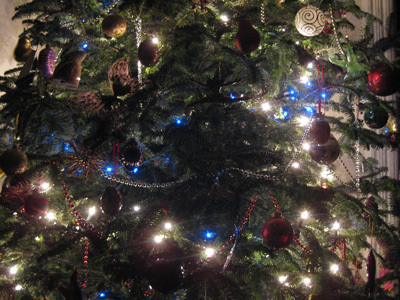 I hope that this post sees you all well, and happy holidays from our family to yours! I keep on playing around with pork shoulder braises, and what’s not to love? 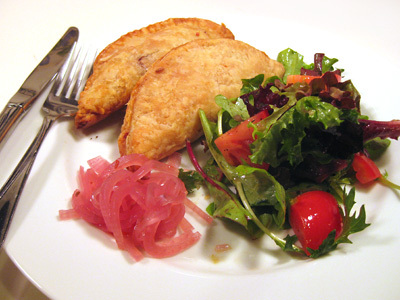 They make a great meal, and the leftovers can be used in a myriad of ways such as pulled pork sandwiches, stews, chilis, meat pies, etc. The picture above was the only one I had time to grab for this recipe, but I was so happy with it, I wanted to record it up here. I made it the night before, so putting on dinner the next day was a snap, and boy was it good! Preheat oven to 300F. In a mortar and pestle, coarsely grind the fennel and coriander seed. Remove the skin from pork shoulder and score the fat. 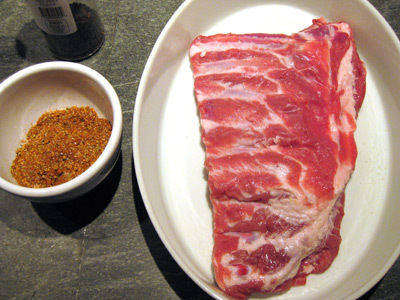 Rub 1 tsp of salt and the ground spices around the pork, let it come to room temperature for 20 minutes or so. Heat a splash of grapeseed oil in a dutch oven until very hot. Sear all sides of the pork and then remove to the side. Slice the slab bacon 1/2 inch thick and brown it in the dutch oven, then turn the heat down to medium and remove the bacon to the side as well. Saute the onions until they start to turn translucent, then add in the carrot, celery, garlic, and spices. Place the pork shoulder on top and pour in half a bottle of white wine. Bring the liquid about 1/4 up the side of the pork, adding water if needed. Scatter the slab bacon around, place the bouquet garnis in the pot, and scatter around the napa cabbage. Cover and cook for two hours, then flip the shoulder and cook for another 2 hours. Remove the pork shoulder to a cutting board and let cool for 15 minutes, then using two forks gently pull the shoulder apart to separate the bones and fat from the meat. Also remove the slab bacon. 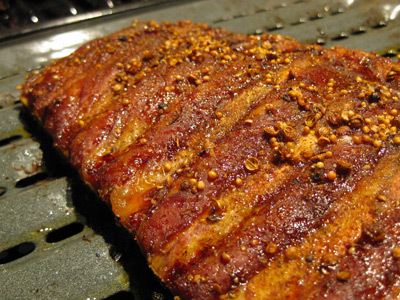 If you refridgerate the pork and bacon overnight, as I did, then slice any large chunks of pork into half-inch-thick pieces, and sear the meat on both sides in a hot non-stick skillet. Do the same with the bacon, and plate, grinding some coarse salt and pepper onto the pork. If you are serving the braise immediately, skim the liquid fat off the top of the braised vegetables in the pot. If you put in the fridge overnight, the fat will solidify on the top making it much easier to remove. Re-heat in a pot, not a microwave! Ladle several large spoonfuls into a food processor and blend into your gravy. With a slotted spoon to drain excess liquid, plate some of braised vegetables next to the meat and serve with a side of your choice — in our case, Lisl made a salad of fresh peas (parboiled and then immediately cooled in ice water), jicama, red onion, and cherry tomatoes, with a lemon juice, olive oil and thyme dressing.